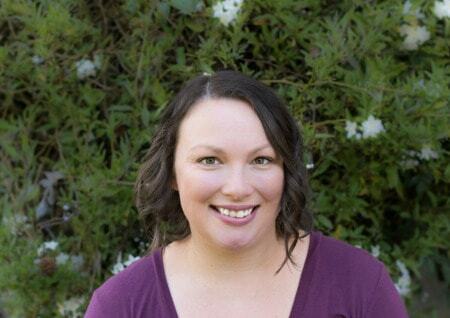 January 13, 2017 By Aileen 2 Comments This post contains affiliate links. As an Amazon Associate and member of other affiliate programs, I earn from qualifying purchases. 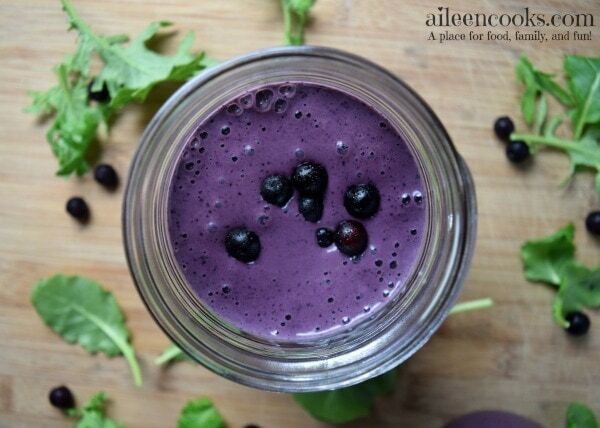 This blueberry kale smoothie is filled with creamy frozen blueberries, baby kale and and sweet banana. Filled with protein from creamy Greek yogurt and vanilla protein powder, making it the perfect breakfast smoothie to start your day off right. I have been back on the exercise and healthy eating bandwagon now that I’ve come out of the newborn haze and this smoothie has helped me more like myself. It’s an easy and healthy breakfast I can whip up for myself quickly. Which is important because I have been guilty of not feeding myself lately. I hadn’t done much with protein powder in the past, but a friend mentioned she had been adding protein powder in her smoothies and then Trader Joe’s came out with a line of pea protein powders, so I decided it was time to try it out. The protein powder I use in this blueberry kale smoothie is the vanilla protein powder from Trader Joe’s. The vanilla protein powder and vanilla almond milk pair really nicely with the blueberries. I almost considered naming it a blueberry vanilla smoothie, but decided on blueberry kale smoothie since kale is a vital ingredient for a “green smoothie”. If you haven’t had a green smoothie with kale before, this is the perfect kale smoothie for you (and your kids). 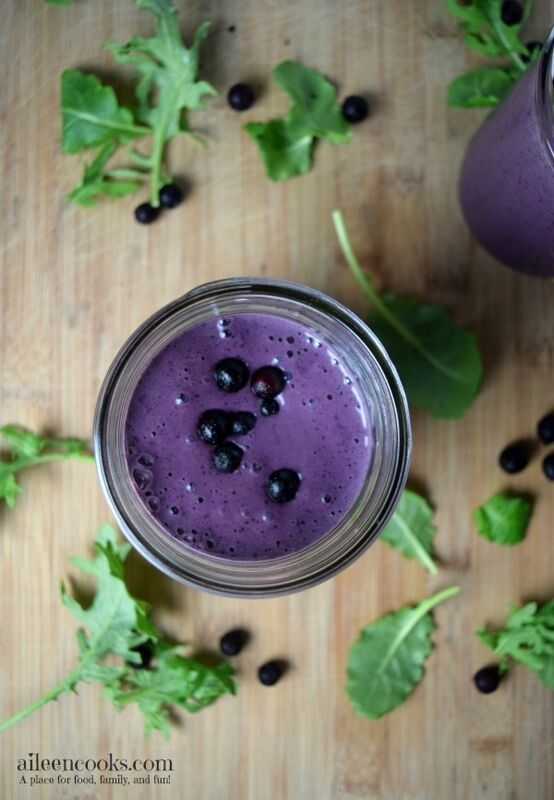 You can’t taste the kale and it stays purple – thanks to the blueberries. 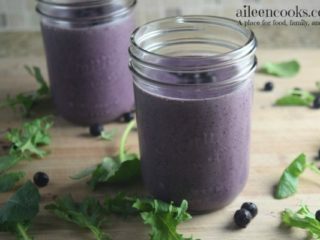 My kids follow me around like I haven’t fed them in a week each morning until I share this blueberry kale smoothie with them. It’s that good. 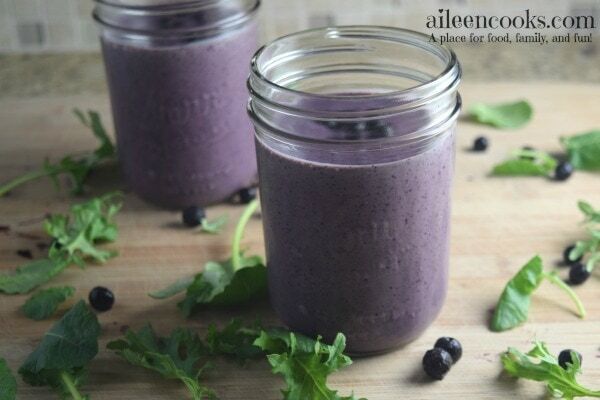 This blueberry kale smoothie recipe makes one large smoothie. It is perfect for one person as a meal replacement or for two as a snack. Place all ingredients into the cup of a blender and blend until smooth. If using a less-powerful blender, blend the kale, almond milk, and protein powder first. Then, add the Greek yogurt, banana, and frozen blueberries. Blend until smooth.